All meetings held in Cloverfield unless otherwise stated. Members and guests invited to bring old photos, artefacts and items of interest to the group. Glin Historical Society hosts Shanid Historical Society for a tour of Glin Castle and Glin town. Val O’Shaughnessy has agreed to do a film show at our February meeting. It will feature footage of Glin from 1966 in the time when farmers queued for the creamery and created a vibrant atmosphere. 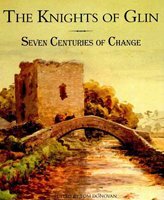 Sunday 21st April 2013 Glin Historical Society host a Shanid Historical Society visit to Glin Castle followed by a walking tour of Glin town. Glin Historical Society welcomed Shanid Historical Society (Shanagolden) to Glin on Sunday last, April 21st. A large crowd of over 70 people attended a tour of Glin Castle and later a walk around the village. Marian Prendergast gave a very informative guided tour of the artefacts and portraits in the castle, interspersed with historic tales and anecdotes. A break for a welcome cup of tea was followed by a tour of the sites of interest in the village. The weather was beautiful and everybody seemed to enjoy the afternoon. There are many publications about Glin and by Glin people and most of these are in Glin Library.